The global fossil fuel divestment movement just got a huge push from an unexpected place—Ireland. On July 12, Ireland became the first country to vote to shed its financial holdings in oil, gas, and coal corporations. 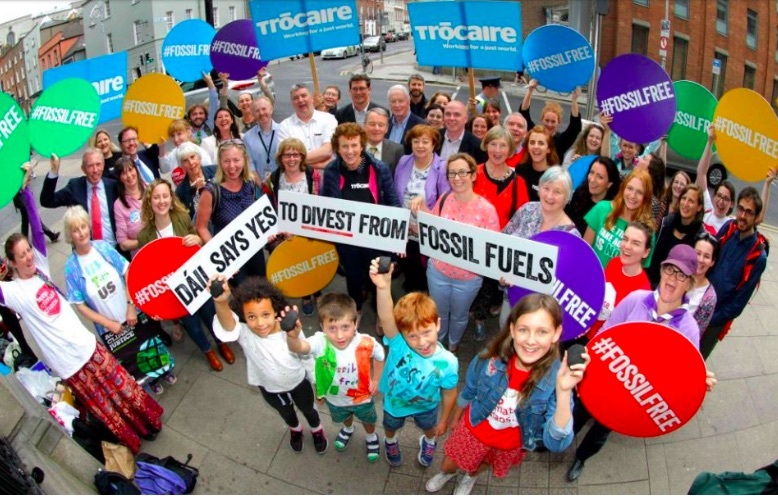 The measure calling for the country to sell off its estimated $370 million in fossil fuel investments “as soon as is practicable” passed the lower house of the Parliament of Ireland with support from all parties. The vote marks a major milestone in the effort to move capital away from the largest carbon polluters. “This is the next step in a progression . . . of what people considered impossible and unprecedented, but it makes perfect sense that that’s what’s happening,” said Andrew Behar, CEO of the socially responsible investment firm As You Sow. Ireland’s move is the latest surge in the rising tide of the divestment movement, which now includes universities across the United States, dozens of Catholic institutions, and New York City, which earlier this year announced it is investigating selling off its fossil fuel holdings. Go Fossil Free, a group that advocates for fossil fuel divestment, estimates that $6.15 trillion worth of fossil fuel assets have been sold off since the movement started in 2010. “First we had student movements, then we had mission-driven organizations—faith based and philanthropy—and now we have entire countries,” said Clara Vondrich, global director of Divest Invest, which provides institutions with guidance on how to move their money away from fossil fuel corporations. The move surprised some people, as Ireland has something of a reputation for being slow to act on climate, in comparison to other European nations. Bill McKibben, co-founder of 350.org, tweeted that the news of the vote “staggered him.” The Climate Action Network recently declared Ireland the second-worst country in the EU for climate change management. The only other country to consider such a move is much-wealthier Norway, which has proposed divesting its $1 trillion sovereign wealth fund but hasn’t done so yet. Ireland’s vote is particularly important because it reflects a major shift in the divestment movement, Vondrich explained. Originally, fossil fuel divestment was entirely driven by moral concerns—institutions pulled their money out of oil, gas, and coal companies because they didn’t want to be contributing to the destruction of a stable climate. Now, divestment is increasingly seen as a smart financial move for investors; Ireland’s divestment is as much a fiduciary decision as it is a chance to demonstrate its principles. “The divestment movement now stands on a strong three-legged stool of moral, fiduciary, and financial arguments,” Vondrich said. Energy stocks were the second-worst performing sector in 2017, states IEEFA’s report, outpaced by health, technology, and other industries even as the price of oil stabilized from a low of $28 a barrel in 2016 to $75 today. Fossil fuel companies’ relatively weak performance is crucial, given that some investment institutions are required, by their charters, to prioritize profit performance and fiduciary responsibility above all other concerns. Ireland’s vote, Vondrich said, solidifies the argument that divestment is the financially savvy choice for investment managers. Vondrich said the strategy going forward is to continue to push for divestment decisions as well as divest-invest pledges in which divested funds are reinvested in enterprises committed to sustainability and clean energy. Ultimately, the goal is to demonstrate that buying shares of fossil fuel corporations is not a wise investment.